But finally got out of the house with chicken pox free children! I met a friend for lunch and did a bit of retail therapy for the kids and myself! Got to see a little of Dawn on C&C then time to do dins for the lil uns! Catching up on Suits tonight, such a good show but we are a few weeks behind. Love V+! Would like to still share something tho! Made this for all my daughter's hair bits n bobs as they were everywhere. It didn't work as they are still everywhere but this still looks nice in her room! 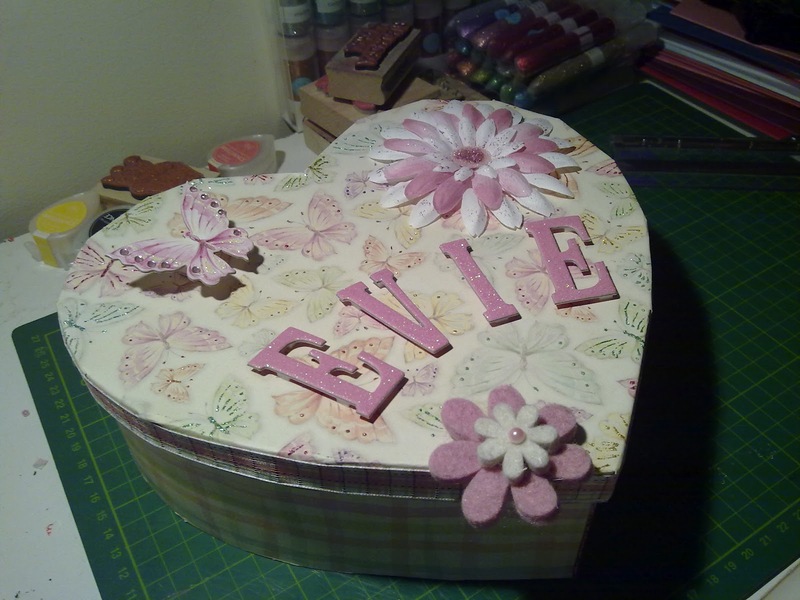 The heart shaped box was purchased from Hobbycraft, the paper is K&Company Hopscotch paper pad and the butterfly that I put on a Docrafts spring was also K&Company from the matching embelishment set. The Felt flowers are from my local craft shop and the fabric flower from a Petaloo set I Love You from QVC. It was simple to do but a little fiddly so needed patience and lots of glue! It doesn't look like this now as my 2 year old son got hold of it but it is in line to be repaired!!!! First Trip To The Barbers!